Note: the first time you create a segment you’ll see handy tips that will walk you through how to create a segment. In your WebbMail account you can create both groups and segments. Groups are static and a way to categorize contacts when they are imported or created in your account, while Segments are dynamic and based on data you expect to change over time. Segments allow you to refine your target audience to make your messaging more relevant and effective. With Segment Builder you can build dynamic searches in your audience based on specific criteria. 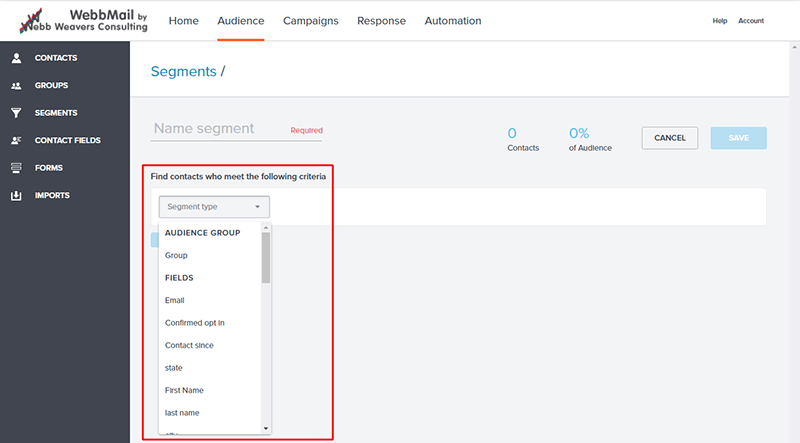 Once a segment is defined, you can send to these segments just like audience groups. The send process in a mailing will refresh the contact data in the selected segments, and the counts will reflect the updated information automatically. Create segment name. Name the segment, and be sure to make it easily identifiable. Audience Group – contacts in existing audience groups to be included or excluded. Fields – creation of segments based on specific contact fields you have defined within your contact audience. The conditions will vary based on the field type used when the contact field was defined. Signup Activity – criteria based on signup activity, with conditions based on dates and the signup form used. Select the Condition. The filtering will vary based on the segment type selected and the field type defined in your audience group. Most conditions, such as “Contains” or “Equals,” requires a value in the adjacent field to validate against. Note: When segmenting based on a field, the value for ‘equals’ must match the case as it appears in your contact record. This can happen when the Contact Field Type is Short Answer, Long Answer, or Numeric answer, so be sure your criteria will include all appropriate contacts. Add additional segment criteria using the AND / OR functionality. To create complex segments with additional filtering criteria, select the AND or OR button. Both buttons will add additional criteria with Segment type and Condition. AND criteria will require contacts to meet ALL the criteria to be selected. Repeat this process until all criteria have been defined. The number of contacts and percentage of the audience included in this segment will be updated as filtering criteria is added. Click Save to finish defining the segment. Once you have refined your segment criteria, click the Save button. The segment will then be available for mailings. You can create segments that look for contacts within a set mile radius of a specific postal code. You’ll first need to have the postal codes for your members mapped to a postal code member field. Note: This only works with U.S. postal codes. Enter the number of miles and the Postal Code. Enter the radius (in miles) and the zip code. Click “Save to Create” or update the segment.